MGECOM Relaunches the Hide.me Affiliate Program! MGECOM.com is excited to announce the re-launch of the Hide.me Affiliate Program on LinkConnector and CJ and we want you on to join our team! Hide.me offers customers a Virtual Private Network (VPN). We help internet users reclaim their basic right of internet freedom, privacy, security and anonymity. Our VPN servers make customers absolutely secure from government spying, identity thieves, hackers, and many other online threats. In addition, we allow customers to stream the internet for online gaming, or to watch live sports and stream programs like Hulu and Netlix. Please take a moment to view a short video showing exactly how Hide.Me keeps internet users are safe and allows them to view any social media website. PPC Policy with limited restrictions. Contact us for specifics. June 2015 Promo Codes and Offers. New Offers and Coupons from MGECOM Clients! Splash Boutique Free Shipping No Min. No Code No Exp. Rosewe 10% off First Order SAVE10 No Exp. MGECOM.com is proud to announce the Rosewe Affiliate Program has relaunched on CJ! Rosewe offers customers the latest and hottest trends in women’s fashion, from apparel to accessories. Our designers work to bring you the newest trends from the fashion runways of New York, Milan, Shanghi and many others. Not only will customers find amazing looks at fantastic prices, customers receive Free Shipping on every order! If you are not already promoting Rosewe, now is the time to get started. The latest fashion trends are now available, just in time for Summer. You customers will find thousands of products to choose from, no matter the occasion! Phone Power Relaunches on CJ with $75 Commissions! Phone Power Affiliate Program has relaunched on Commission Junction. The Phone Power Affiliate Program has relaunched with new management, new landing pages, new links, and most exciting – we have added two new URL’s for you to promote. In addition to PhonePower.com, we also can accept affiliate traffic to Broadvoice.com and DSLextreme.com. Broadvoice.com offers great residential, unlimited VOIP phone service starting at $8/month for calls within the US and Canada and includes 60 FREE International minutes! Our third URL, www.DSLextreme offers affordable high-speed residential internet service starting at only $27.95/month. Our affiliate-dedicated landing pages have been redesigned to increase conversions and your commissions. $75 Per Sale, the highest in the industry! Pay Per Call Program! Contact us to apply. Thank you for considering the brand-new PhonePower Affiliate Program. We have many great promotions and offers to bring you this year. Due to new client signings, MGECOM has a need for a experienced Affiliate Manager! Join MGECOM and enjoy the ability of working from home with a flexible schedule, while you work to increase the performance of the affiliate marketing program for our well-known clients! Writing informational newsletters to be sent to large numbers of recipients. Reviewing, evaluating, and processing applications submitted by individuals interested in participating in our clients’ affiliate program. Developing informational reports which are delivered to our clients. Writing blog articles to be posted on our corporate site. Maintaining open lines of communications with affiliates, responding to affiliate inquiries promptly, and developing supportive relationships with affiliates. Implementing various campaigns, promotions, and events designed by our and our clients’ teams. Policing affiliate’s marketing activities for adherence to program terms and conditions. Recruiting potential affiliates into our client’s marketing programs. 3+ years of experience in the affiliate marketing industry. Basic knowledge of HTML is required. Degree in Business Management, Marketing, Advertising, Operations, or related field. Interest in learning about new and developing internet technologies. Ability to work with large groups of diverse people. Strong organizational, analytical, presentation and problem solving skills. Ability to understand numbers and trends and develop action plans. Ability to communicate clearly, professionally, and courteously over a variety of mediums. Willingness to embrace and understand new concepts. 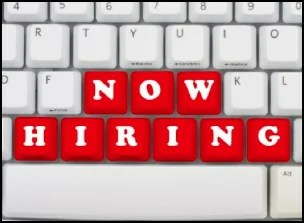 Interested candidates should submit a resume AND cover letter to jobs@mgecom.com. Applications lacking a cover letter are likely to be ignored. Please note: Applications are being accepted immediately. March Offers from MGECOM Clients! Free Shipping – One Day! MGECOM Releases a Mobile App for Affiliates! 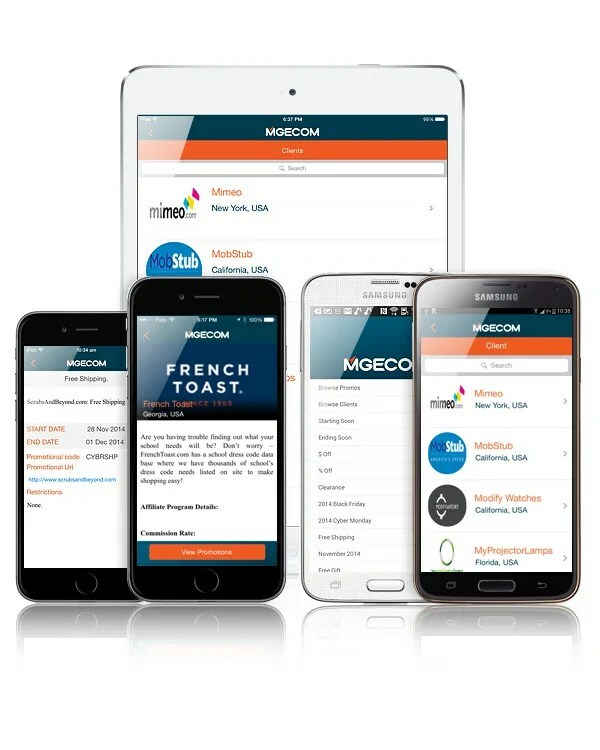 MGECOM, Inc., the leading provider of Outsourced Affiliate Program Management Services, is proud to announce the release of their new Mobile App. Available for free, and without any in-App advertising, for both iOS and Android devices the MGECOM App creates a new, streamlined method of communication with affiliate marketers. Touted as offering “continuously current client coupons”, the MGECOM App provides affiliates with up to the minute promotions, offers, coupons codes and other timely details from the MGECOM-Managed Affiliate Programs. In addition to receiving our client’s latest offers, affiliates will be able to learn more about our clients including their commission rates, PPC policies, and cookie duration, in addition to also being able to apply to any of the affiliate programs managed by MGECOM. MGECOM invites all affiliates to download the MGECOM by visiting the Apple App Store or Google Play. Please contact MGECOM at info@mgecom.com for additional information. MGECOM, Inc., headquartered in Cary, NC, is one of the longest running, and largest Outsourced Affiliate Program Management firms in the industry. Founded in 2006, MGECOM is not a one-stop shop for all online marketing needs; rather we focus on and provide only affiliate program management services. Our team has over 100 years of cumulative experience, and our Clients average over 300% Year-Over-Year growth. MGECOM.com is excited to announce the re-launch of the Boardwalk Buy Affiliate Program on ShareASale. Boardwalk Buy is one of the largest daily deal sites offering the best Flash Sales in categories your customers are looking for. We offer electronics, health and beauty, home goods and toys and much more, all with savings up to 90% off retail and Free Shipping on all orders! We deliver to both the US and Canada, and welcome affiliates targeting the Canadian customers to join our program. Deep linking to product pages. Always available 5% Discount Coupon Code: Save5. Thank you for considering the brand-new Boardwalk Buy Affiliate Program! We have many great promotions and offers to bring you this year! If you are not already a part of the Boardwalk Buy Affiliate Program, now is the time to join and see your earnings take off!